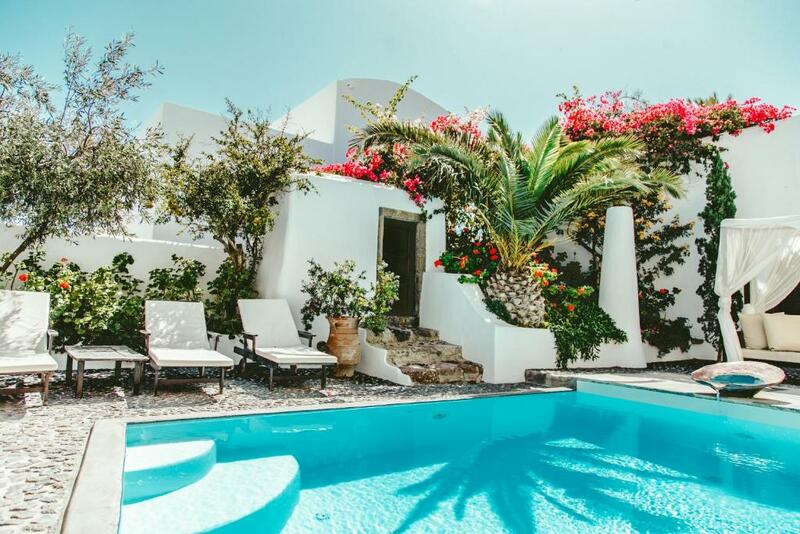 Located within a 5-minute walk from the center of Megalochori, the carefully renovated Santorini Heritage Villas feature private pool, large courtyards with garden and elegant decoration with traditional details. All villas offer free Wi-Fi and easy access to restaurants. 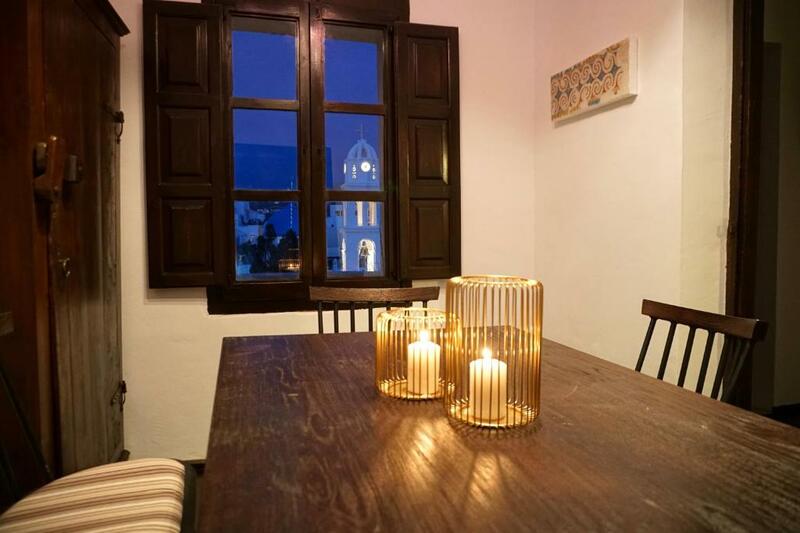 Featuring high vaulted ceilings and polished wooden floors, authentic details from the original historic houses the villas are set in, all properties at the Santorini Heritage, offer spacious accommodations and a well-equipped kitchen and dining area. Each villa includes a living room with elegant sofas. Guests can relax on the beautiful courtyard by the pool that features sun loungers, seating areas and dining tables. The lively Fira is 3.7 mi away. Vlychada Beach is 3.1 mi away and Perivolos Beach lies within 3.7 mi. The famous caldera of Santorini is only 10 minutes' walking distance from the villa. 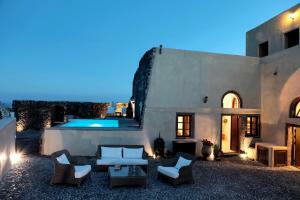 When would you like to stay at Santorini Heritage Villas? On a hill top, this villa overlooks the vineyards and village. 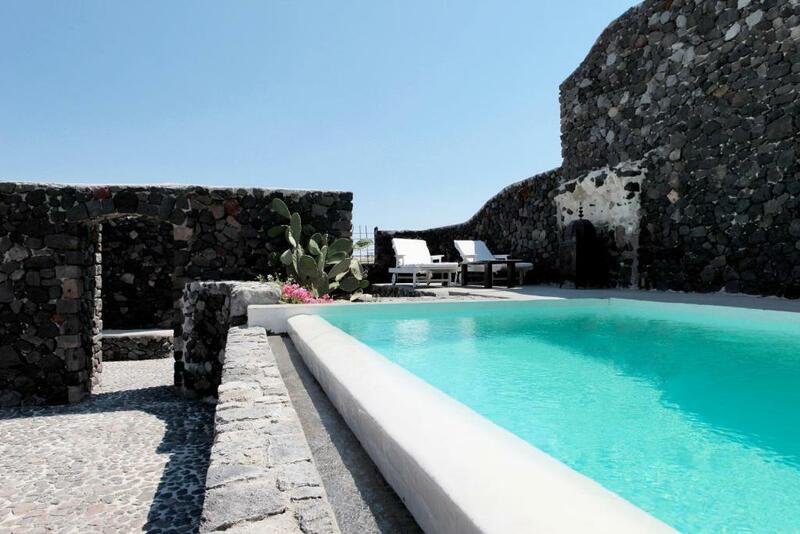 It features a large cobblestone courtyard, a private pool and a deck made out of volcanic rock. The ground floor has a full kitchen, a master bedroom with a domed ceiling, and a private bathroom with a large tub and a separate shower. There is also a second spacious bedroom and bathroom. The first floor has a large terrace with a dining table and panoramic views of the area. There is a third bedroom and dressing room that leads into a spacious bathroom with a large tub. On this floor, there is also a second kitchen. Free Wi-Fi is available throughout the villa. Please note that there is a 50-yard distance between the villas. This historic villa is only 50 yards from the center of the village. 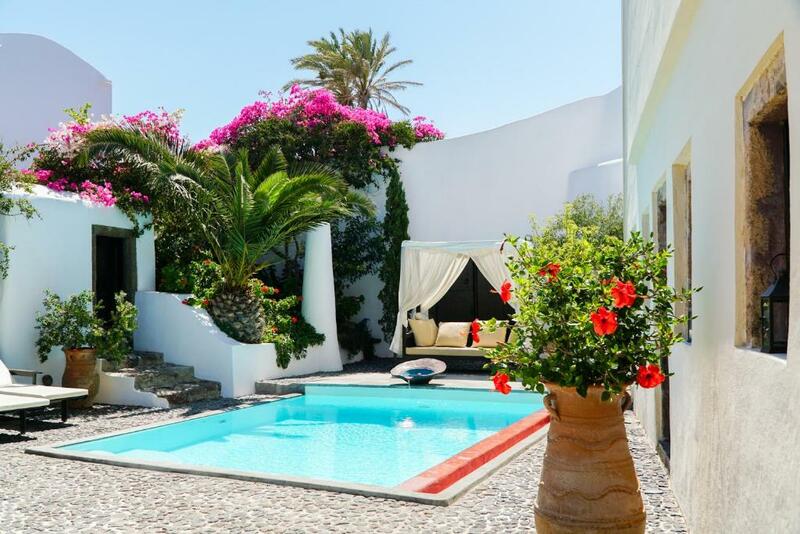 It features a secluded courtyard with a garden and a Moroccan-style pool. There is also a smaller courtyard where guests can dine. The courtyard leads to a spacious living and dining area. There are two bedrooms with one shared bathroom. The villa provides a full kitchen and free Wi-Fi. Hello! My name is Takis and I am the manager of Santorini Heritage Villas. You are welcomed to come and stay at our villas on the beautiful island of Santorini ! If you have any questions feel free to ask! The peaceful little village of Megalochori is a much sought after and appreciated holiday base from which to enjoy the many attractions of this unique island. Only 6 km from the busy town of Fira, it is another world and an ideal holiday base for those who want to relax and enjoy the many attractions of Santorini from a different perspective. This traditional settlement has retained its charm and authenticity despite the rapid touristic development of Santorini. 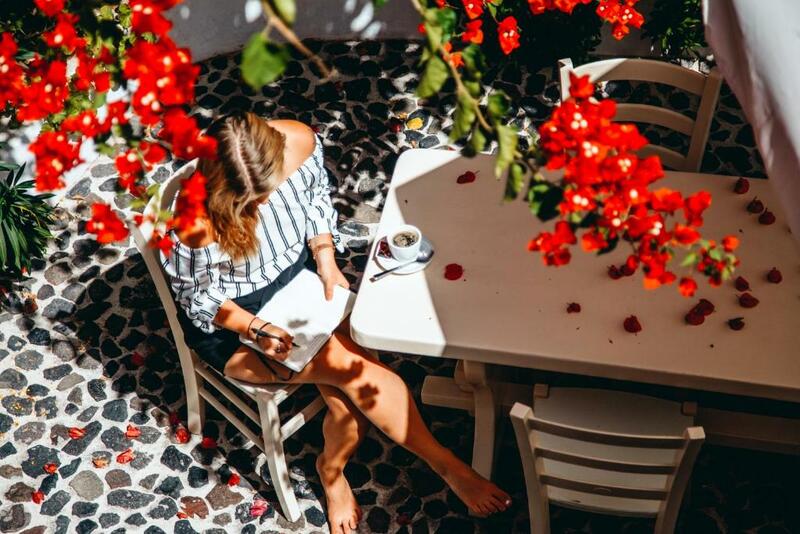 Its traffic-free cobblestone streets, its venetian bell towers and its lovely square with the chic restaurants make Megalochori a premier destination for the concerning visitor of Santorini. The location of the village is perfect, as the most significant touristic attractions and the best beaches of the island are only minutes’ drive away.. Megalochori has also a lovely unspoiled caldera part with no buildings, perfect for hiking with magnificent vistas of the famous volcano and sunset. House Rules Santorini Heritage Villas takes special requests – add in the next step! Up to two children from 3 to 15 year are charged EUR 20 per person per night for extra beds. 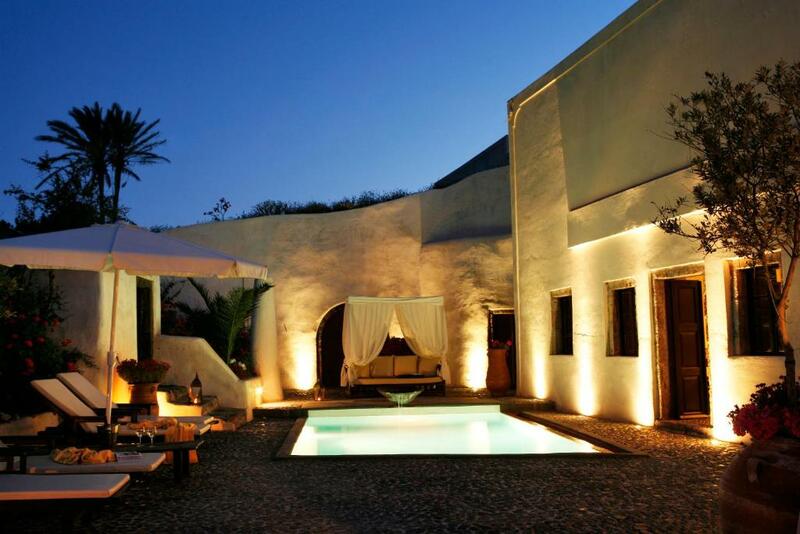 Santorini Heritage Villas accepts these cards and reserves the right to temporarily hold an amount prior to arrival. Please note that there is a 150 feet distance between the villas. Please inform Santorini Heritage Villas of your expected arrival time in advance. You can use the Special Requests box when booking, or contact the property directly using the contact details in your confirmation. We need at least 5 reviews before we can calculate a review score. If you book and review your stay, you can help Santorini Heritage Villas meet this goal.